24th of January 2011, Hizb ut Tahrir Europe organized a demonstration against the visit of Karimov, president of Uzbekistan, in front of the Uzbek Embassy in Brussels. Hundreds came to show their support for Hizb ut Tahrir and to confront Karimov, for his crimes against Islam, the Muslims and humanity in Uzbekistan. Speakers highlighted the various crimes of Karimov and his regime, including the mass murder on the 13th May 2005 when he ordered his special security forces to attack unarmed protestors in Andijan; thousands of people, including many members of Hizb ut Tahrir, were killed. The Andijan massacre is part of a much broader pattern of oppression that has characterized Karimov’s rule. These include the severe torture of independent Muslims and members of Hizb ut Tahrir’s prisoners. The severe mutilations that some suffered resulted in the death of many innocent people. The silence of Western governments against these crimes has been deafening. Furthermore, one of the speakers highlighted how the European Union (EU) and NATO revealed their real face by inviting and welcoming this tyrant. Western governments do not care about the fate of the Muslims of Uzbekistan or anywhere else. Rather, they support unelected dictators in order to secure energy contracts and other profitable interests. Regimes like Karimov’s in Uzbekistan were given the free hand to attack Islam and the Muslims and the ‘International community’ has turned a blind eye to it. Hizb ut Tahrir Europe condemned the regime’s imprisonment of thousands of members of Hizb ut Tahrir and other Muslims and demanded their immediate release. Our message to Karimov and his regime is that we have promised Allah (swt) that we will never bow our heads before any tyrant and will continue to speak the truth with patience and firmness and work tirelessly to re-establish Al Khilafah Ar Rashidah. The torture and repression of Muslims in Uzbekistan continues unabated a mere week after the visit of the tyrant Islam Karimov to Brussels. Karimov went to Brussels and met with NATO Secretary-General, Anders Fogh Rasmussen, the European Commission President, José Manuel Barroso, and EU Energy Commissioner Gunther Oettinger. He was given a red-carpet welcome and promised more financial aid in appreciation of his efforts in fighting terrorism. Less than a week later the administration of the infamous Yaslik prison in Uzbekistan delivered two corpses of members of Hizb ut-Tahrir – one from the city of Andijan and the other from Ferghana – claiming that they had died from heart disease. The administration of Yaslik prison also randomly increased the prison terms of other members whose sentence was nearing its end. One member, Shukrullah, was given sixteen more years, whilst another, Shaukat, was given another three, and both were transferred to an ex-offenders prison. At other prisons such as Navoi, prison administrations have started giving prisoners from the members of Hizb ut-Tahrir medications and forcing them to take it in front of prison guards. These medications have ‘made in America’ written on them and they resemble bread dough in their color and form. It has been noted by prisoners that whoever takes this medication more than once begins to lose their strength and sensorial ability day-by-day. From among these prisoners are those who have memorized the noble Qur’an, which they memorized in their long stay in prison. It has also been noted that many prisoners go beyond simply losing strength and sensorial ability, and lose their sanity. They are then transferred to state-run hospitals. This is but part of the horrifying reality of what happens under Karimov in Uzbekistan; a reality which Western leaders are well aware. 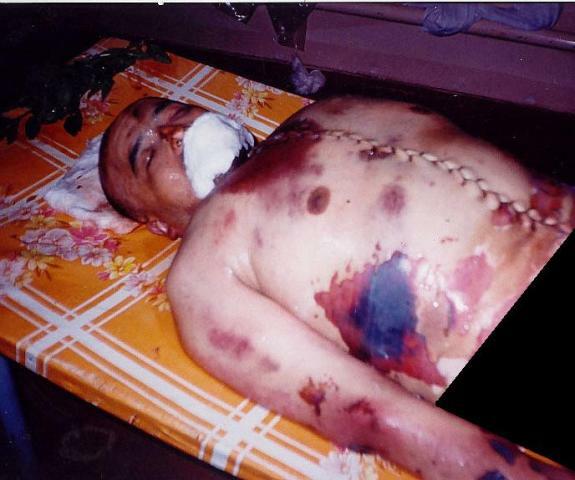 Western governments have not forgotten the massacre of thousands in Andijan in 2005. However they justify turning a blind eye to Karimov’s crimes on grounds of it being a cheap and necessary price to pay for the continuation of their alliance with him in the invasion of Afghanistan. It seems difficult for those who have built their civilization on the massacre of the Red Indians in America, and those who persisted in supporting tyrants in Egypt, Tunisia, Pakistan and other Muslim lands for decades, to properly criticize or sever ties with Karimov. Nonetheless will they have no shame at all given their claims of democratic values and human rights of which they sing day and night?! Or is hypocrisy a basic tenet of their wretched imperial thought?! In any case, Hizb ut-Tahrir has not and will not depend on these people for anything. Its members have a covenant with Allah to believe in Him and rely on Him. They will not relent or soften, by the Will of Allah, in fighting falsehood and its patrons until Allah سبحانه وتعالى gives victory to this Ummah, and He is the best of liberators. The following is from a series of letters from the Da’wah carriers in Uzbekistan which have been translated. All praise be to Allah, the Lord of the universe and mankind. His help, victory and most importantly His pleasure be to the Messenger of Allah, his companions, their followers and all the believers from Adam until the last believer on the Day of Judgment. May He the Merciful forgive and grant felicity of the worldly life and hereafter to all the believers. That is why we decided to inform you of the current situation in here, so that believers shall realise the great crimes that take place here, UYA-64/71 Jaslyk colony, which is done by kufr – i.e. by the Kaafir Karimov and his tyrant executioners, particularly the chief of colony Qulimbetov – the cruellest tortures and torments. We hope this will help the believers to see the injustice, that they will have a just hatred and immunity against the plots they lay and be steadfast in the Deen and the da’wah. So that on the Day of Judgment we will not be those who escape each other, on the contrary, we will enjoy happy lives in the Paradise promised by Allah. Brothers, nowadays the barbarous tortures in this torment facility of the Kaafir, Karimov, are at their highest point, the chief of the colony Qulimbetov has brought from his previous place of work Qorovul-Bozor prison of Bukhara several criminals, who have already served long-term (15-20 years) prison terms. He cruelly oppresses and harshly persecutes our brothers by their and other operative officers’ means. All firm-footed brothers, who reject asking for the president’s pardon, fulfill their prayers, refuse to sing – as contrary to our faith – the anthem as well as other brothers are battered and beaten for no reason. It has been over one month since our brothers from Tashkent, Zufarov Nu’man, Muzaffar, Husniddeen and Jamoliddeen were held and tortured in damp basement cells. Cell No. 15 was transformed into a torture room, where the giant hypocrite Yoldosh Beruniy from Khorezm, together with other prisoners named Anvar and Edik from one side, on the other side the new-comers from Qorovul-bozor named Ravil, Farkhod and Isroil ‘the Toothy’ continuously torment our brothers with the purpose of making them ask for president’s pardon, sing an anthem, not perform a prayer and so on. Qulimbetov has given them all necessary authority. Today is August 5th, within the last 20-25 days, our brother Bahrom from Ferghana was beaten unconscious by Edik and left in such a state for over one hour. Our brothers from Tashkent, Saidazim, Jamoliddeen and Fitrat, and Rasul from Margilan, were cruelly beaten in cell No. 15; Jamoliddeen’s shoulder bone was fractured. Additionally, the local officers also take their share in torturing our brothers. Today, August 6th, tyrant Anvar, Yoldosh and Edik were allowed by disorder prevention department (DPD) officers to lock our brothers Zufarov Nu’man, Husniddeen and Muzaffar in separate basement cells and severely batter them. The battery of other brothers caught praying also continues. Our fellow Oybek was locked into special cell (called BUR) for one month. The DPD personnel has in advance warned firm-footed brothers Yusupov Maqsudali, Madyarov Akmal, Tojiboev Ergashali and Mirzakarimov Ravshan from Ferghana, Salohiddeenov Samariddeen from Tashkent, Guzarov Shavkat from Qashqadaryo and others about the punishment awaiting them. Who of us may go to that torture room tomorrow? May Allah protect us from this. It is believed that this method of torturing is know-how invented by Qulimbetov and the deputy minister of Justice Shodiev. Allah knows best. Our fellow Bahrom from Ferghana has written a letter to Qulimbetov, where he warns the latter, «Stop these tortures, otherwise several of your executioners shall die or some of us shall become martyrs». Despite this, the persecution gets harsher. Of course, these are the tests from our Lord. We shall be patient. However, Allah says in His book, “Verily never will Allah change the condition of a people until they change it themselves (with their own souls)” We, your oppressed brothers in Jaslyk, are saying goodbye to you until our Lord gathers us all with His help, victory, felicity and, most importantly, in His paradise (hopefully) Assalamu alaykum wa rahmatullahi va barakatuhu. PS. Today, August 7th, some additional information has surfaced. Yesterday late at night our brothers locked in the basement had hot water poured over them and early in the morning they were taken to nursery. Among them was Zufarov Nu’man. Assalamu ‘alaikum wa rahmatullahi wa barakatuhu. I sent you part of the treatment that has been inflicted on us by the ruling authority in Uzbekistan; the prosecution, imprisonment and torture which amounts to death in many cases. Such treatment is not limited to us only in Hizb ut-Tahrir but includes all of the workers for the Islamic Call. The number of prisoners from Hizb ut-Tahrir alone in the prisons of Uzbekistan is approximately eight thousand, even though that party does not exert any acts of violence. The oppression of this government was aggravated more this summer than throughout the year. At the beginning of this summer, all the new masools (leaders) who were appointed after the arrest of their predecessors have been arrested. A large number of our active shabab were also arrested. This happened in Tashkent, the capital, in the state of the Ferghana Valley, the state of Andijan and in other states of Uzbekistan. Many of our shabab started to travel outside the country to work there to avoid the arrest. Nevertheless, the spies of the authority are watching and spying, even on those who travel abroad. In these days in the month of Ramadan the spies of the authority came to ask about who had traveled, and when they did not find them, they took their relatives and held them in their centers to know where their sons went. In addition, they threatened them that they will remain in detention until their sons come back. They treated them with cruelty and brutality, some of them even fainted and the older fell to the ground from fatigue. The authority started to assign its employees in the water and gas departments; the members of the Shura Council being men and women of the locality who were assigned to spy to know where the families of prisoners get their expenditures, where they eat, wear, and how they live. The prisoners who have completed their sentences; they blackmail them to leave the work with Hizb ut-Tahrir and start working with the authority, to spy on the party. Moreover, the one who refuses, they say to him: “You have not completed your treatment yet” and they increase his sentence to three additional years in prison. There are many of those who spent additional years and they did not release them, but they returned to blackmail them. This is the ruling authority in Uzbekistan. We will not bow to its oppression and will continue working in the legitimate way (sharee way) to change it, we will be patient with Allah’s help and with the assistance for our Muslim brothers in this country and in other Muslim countries, we will be patient until Allah judges between us, and Allah is the wise of the wises. The systematic torture meted out by the corrupt Karimov regime against the Shabab of the Hizb ut-Tahrir in Uzbekistan has intensified greatly in recent times. We have received the following update from Central Asia. “Indeed this oppressive ruler has instructed his cronies to imprison further Shabab and intensify their punishment and prolonging their prison sentences to a minimum of 10 years and over. Recently, 18 Shabab from Karasawa have been imprisoned, a further 10 from Tashkent and 15 from the North, all receiving sentences ranging from 10-13 years. This is on top of the many thousands of Muslims which already languish in the prisons. As a result of the torture, 3 shabab were recently martyred who include: Ghalib Malajanoth from the city of Andijan, Shadman from the city of Nahayat Asaka and Abdulraheem from the city of Karasawa. Not withstanding the oppressive imprisonment of the Shabab, the corrupt regime has resorted to new tactics by imprisoning their relatives, some even under 15 years old! They have also imprisoned some of the wives and daughters of the Shabab, including some under the age 15! They have also imprisoned women whom their husbands are either already imprisoned or previously martyred! All this pressure is a result of the Shababs’ refusal to surrender and leave their Deen! Oh Brothers and Sisters! Please make dua for us against this corrupt ruler and his oppressive regime by asking Allah سبحانه وتعالى to strike him down and humiliate him in this dunyah before the Hereafter. Pray to Allah سبحانه وتعالى to relieve the pain and suffering of our brothers and sisters and to retaliate against the oppressors and humiliate them so that everything between the heavens and earth curse them – Oh Allah the All-Mighty. The writer argues that despite Hizb’s professed alliegence to non-violent means Hizb provides moral support to groups like Al Qaeda and the Islamic Movement of Uzbekistan. (IMU) and that individuals from Hizb do become engaged in jihadi events. This article provides good reasons which Hizb ought to be banned in America. For Central Asia Hizb is the problem. Hizb-ut-Tahrir: The Solution or the Problem? The aura of mysticism associated with the activities of the Hizb-ut-Tahrir, a well known radical Islamic group, continues to baffle security experts across the spectrum. Most recently the group was in news when the British Government decided to ban the Hizb-ut-Tahrir operating in Britain in the aftermath of the July 2005 bombings in London . The decision to ban the group, argue many human rights activists, contravenes the UN Declaration of Human Rights and more specifically articles 19 and 20 which guarantee both freedom of expression and association. The Hizb-ut-Tahrir is a radical Islamic political group active in several countries in the Middle East, South and South East Asia, Central Asia and Europe . The group was established in the 1950’s in Jerusalem and was perhaps the first to initiate political activism for the Palestinian cause. It was accused of plotting against the various Arab regimes in the region and was banned by most countries, with its members arrested and persecuted. Subsequently, the group then targeted the Muslim community settled in Europe and established itself firmly in the UK , Denmark and Germany . Among the reasons why the members of this radical religious group were granted asylum by the Western countries was a belief by these countries that their interests would not be harmed by the religious and political activism of the group. Even after 9/11 and the consequent monitoring of radical Islamic groups, the Hizb-ut-Tahrir and its sister organisations like the Al Muhajiroun continued to operate freely in Britain and other Western countries. The West perhaps viewed them as viable political and religious alternatives to the extremist ideology of the Al Qaeda and other anti-Western, pan Islamic religious terrorist organisations. The Hizb-ut-Tahrir shares the ideology of the Al Qaeda and other religious terrorist groups which claim that the malaise of the Muslim ‘Ummah’ (community of believers) is rooted in the destruction of the Caliphate brought about by the connivance of the Western powers. Only an ideal Islamic Caliphate can bring the Muslims together as a unified community and resolve all the prevailing disputes and conflicts. The perceived but not necessarily implied difference between the Hizb-ut-Tahrir and the Al Qaeda is the fact that while the former insists that the end does not justify the means and that the Islamic Caliphate can be ushered in by non violent political activism, the latter has carried out a series of violent terrorist acts, which it claims are justified for the ultimate cause which is to struggle against the ‘kufr’ (non believers) and wage an armed jihad to re-establish the Caliphate. There is no direct evidence of the Hizb-ut-Tahrir having taken recourse to violence but individual members have rendered vocal, ideological and even material support to jihadi terrorist groups like the Al Qaeda and the Islamic Movement of Uzbekistan (IMU). Members of this group in Central Asia have been held responsible for the recent political disturbances in Kyrgyzstan and Uzbekistan . There is also some evidence to suggest that after the Iraq war, many of its members have become disillusioned with the non violent tactics and have been advocating a more pro-active approach. Many of its splinter groups, including the Al Muhajiroun of Britain and the Akramiya and the Hizb-un-Nusra in Central Asia have called for a more active involvement in the struggle against corrupt Islamic regimes and the hegemonic Western powers. Some members have also joined jihadi groups. The moot point is that the group since its inception has failed to provide political and religious leadership to the Muslim community. Fifty years of what they claim as non violent religious and political activism has only resulted in the group being proscribed in most countries in the Middle East, Central and South Asia and Europe without any results to show. In fact it is the Muslim world that banned the group and persecuted the members even before the West began to take notice of their anti-Semitic and anti Western propaganda. The Islamic revolution and awakening as promised by the founder, Sheikh Taqiuddin Nabhani, and his followers has not taken off even after more than half a century of its activities. 3. Finally, taking over the governments. The most prominent ideological contradiction emerged in the formative years itself when the group began to plot coups against the governments in the Middle East , resulting in their persecution and proscription. Clearly, the first two stages, as propagated by the ideological founding fathers saw only vain attempts to grab political power. These ideological contradictions have cost the Hizb-ut-Tahrir dear, rendering it ineffective in its efforts to create a worldwide community of believers. Secondly, grass roots activism, which would have been desirable in the first stage, has been superceded by elite activism aimed solely at the capture of political power. The situation today is that the group does not have any credibility in the Islamic world and has also lost the support of the Western powers as a possible alternative to extremist groups like the Al Qaeda because disillusioned members and splinter groups are openly advocating the need for an armed resistance and jihadi terrorism to unify the Muslim ‘ummah’. In such circumstances, the Hizb-ut-Tahrir might not seem as a major threat to peace and security in any region but nevertheless, it is important to keep a watchful eye on the members of this group who are advocating armed resistance. It must not be overlooked that the Hizb-ut-Tahrir has access to material and human resources which if exploited by jihadi terrorist groups can cause more damage than the Al Qaeda alone. Keeping this in mind what are the possible options before the governments faced with the real and perceived threat from Hizb-ut-Tahrir? Firstly, there is a lack of in-depth research on the Hizb-ut-Tahrir and its activities. There are a lot of misconceptions and ambiguities related to its organisational structure and its activities. The governments need to encourage research on this group. It is only after 50 years of its existence that some information and debate on this group seems to have emerged! Secondly, ideology is an important tool that most extremists exploit and it is quite possible to counter them by highlighting the contradictions within their ideological beliefs. This again calls for an understanding of their ideas and beliefs. Most importantly, the Hizb-ut-Tahrir talks about a non violent revolution to bring about an Islamic state structure, but it does not have well grounded theories on the alternate state model that it wishes to create. Public attention must be drawn towards the fact that anarchism has never been successful at any moment of history. Moreover the Hizb-ut-Tahrir has deviated from its original path of cultivating a community of believers before taking over the governments. They talk about a people’s war without the involvement of the people. Revolutions need ideology as well as the support of the masses. Thirdly, intelligence cooperation is very important in dealing with this group. It is important to know about its cells operating in different countries. This can happen only when governments begin to realise that the members of the Hizb-ut-Tahrir can become a threat if they adopt violent methods and religious fundamentalism and terrorism. It is important to make the intelligence agencies aware of the activities of this group in different countries through shared information, analyses and coordination. Fourthly, Pakistan has off late been linked to several terrorist attacks including in London and possibly Sharm-el-Sheik. Though the Hizb-ut-Tahrir is proscribed in Pakistan largely because of its anti Musharraf propaganda, it is important to keep a watchful eye on this South Asian State that is the hub of jihadi terrorism and training. It is important to study the activities of the Hizb-ut-Tahrir in Pakistan and its affiliated groups, individuals and any ISI support that its members may be receiving. There are possibilities that the Hizb-ut-Tahrir members may have developed links with other jihadi organisations operating from Pakistan . Fifthly, it is important to keep track of its finances. The Hizb-ut-Tahrir receives donations from a large number of charities as well as individuals. Dubious charities and individulas who feed their ideology must be discovered and dealt with. Tony Blair’s anti terrorism measures after the London blasts include punishing those who incite terrorism by supporting suicide terrorism and violence. This implies a strict watch over the preaching in Mosques etc. The South East and South Asian countries would do well to keep an eye over religious preaching in madrasas and mosques where most of the Hizb-ut-Tahrir brand of ideology is propagated. In addition, many of its members are the disgruntled youth from universities and educational institutions who are attracted to its ideology. Their grievances should be addressed so that they cannot be exploited by groups like the Hizb-ut-Tahrir. Lastly, the Hizb-ut-Tahrir is well versed in propaganda activism. Its propaganda should be countered by the governments. Its publications and other audio and video materials should be scrutinised and prevented from being disseminated, if they are racist and otherwise detrimental to national and international security. In fact both Denmark and Germany have banned the group on the basis of its anti-Semitic propaganda. The key words in dealing with the Hizb-ut-Tahrir are effective intelligence and greater degree of public awareness through a strong intellectual campaign. The idea is to expose its ideological hollowness that has achieved next to nothing in the last fifty years. The Hizb-ut-Tahrir does not represent the people in any country even if it projects such an image. To conclude, it is perhaps the failure of groups such as the Hizb-ut-Tahrir to provide political and religious leadership to the Muslim community that has led to the spawning of terrorist groups. Frustrated by the empty rhetoric of groups like the Hizb-ut-Tahrir which has only served to divide the Muslim community and aggravate the existing problems and conflicts, the youth are taking recourse to extremist violence and terrorism, as noticeable in the London blasts. The Muslim community needs politico-religious activism and leadership to address and articulate their genuine grievances. The Hizb-ut-Tahrir is not the solution; it is a part of the problem.